“I have today sent a letter to the Prime Minister reminding him that Bougainvilleans are deeply concerned about the future of mining in Bougainville, and determined to control it themselves, through the ABG. 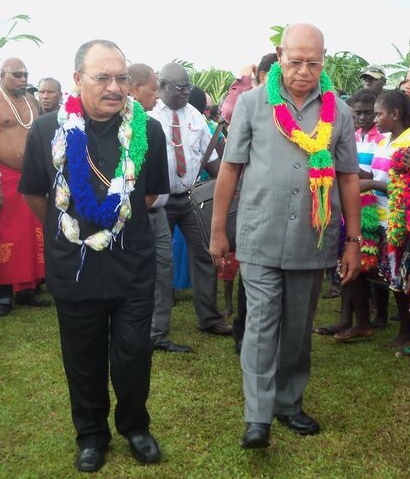 President Momis said today that he was deeply concerned that Prime Minister O’Neill wants the National Government to control future mining at Panguna. On Thursday 9th October the Prime Minister held a three hour meeting with a team form the ‘Me’ekamui Government of Unity’ (‘MGU’). The meeting was arranged by the office of the Member for Central Bougainville, Hon. Jimmy Miringtoro. ‘I will give 35% to Bougainville in any mining in the future’. The President said: “The Bougainville Peace Agreement (BPA) states clearly that the main goal of Bougainville’s autonomy is to ‘empower Bougainvilleans to solve their own problems, manage their own affairs and work to realize their aspirations’. Because of our experience of mining, mining was in the first set of powers that the ABG requested to be transferred from the National Government. “I told him that the idea of the National Government operating mining at Panguna (or anywhere else in Bougainville) is completely unacceptable to Bougainville. Any attempt by the National Government to control mining in Bougainville could cause Bougainvilleans to lose all faith in the BPA. Many would refuse to work with the National Government any more. They would want immediate independence. It would be a recipe for undermining, perhaps even destroying, support for the BPA. “I met with the Prime Minister on Friday 3rd October (just six days before your meeting of 9th October) and again on Tuesday 18 November. Both meetings discussed the Prime Minister’s views about Bougainville. Yet he made no mention in either meeting of the views he expressed to the MGU team on 9th October. “He must explain why he can express such dangerous proposals to the MGU, and refuse to discuss them with me. Is he trying to divide the people of Bougainville?“If such views were expressed by the Prime Minister, they clearly have serious potential for undermining relationships between the ABG and the National Government. “I have today sent a letter to the Prime Minister reminding him that Bougainvilleans are deeply concerned about the future of mining in Bougainville, and determined to control it themselves, through the ABG. The letter is attached to this statement. “This meeting was arranged by the office of Mr. Jimmy Miringtoro. The minutes indicate Mr. O’Neill wants the National Government to control mining at Panguna in the same way it manages Ok Tedi. Other information available to me indicates that the Prime Minister also told the MGU group that the National Government proposes to purchase Rio Tinto’s shares in BCL to allow to control Panguna mining. I have been advised that on Thursday 9th October you held a three hour meeting with a team form the ‘Me’ekamui Government of Unity’ (‘MGU’), organised through the office of the Member for Central Bougainville, Hon. Jimmy Miringtoro, and attended by his Press Secretary, Mr. Chris Baria. Minutes (two pages) from that meeting, apparently prepared by the ‘MGU’ team, have been provide to my Government. They are attached to this letter. ‘John Momis is going ahead of me with important issues – PNG can’t allow that’. In this context you are reported as saying that you believe that mining powers and functions have not been validly transferred to the Autonomous Bougainville Government (ABG) and that the Bougainville Mining (Transitional Arrangements) Act 2014 is invalid. I understand that in this context you proposed that the National Government purchase shares held by Rio Tinto in BCL and control future mining operations at Panguna, similar to arrangements with Ok Tedi. Given the various decisions made since January 2008, jointly between the National Government and the ABG (through the Joint Supervisory Body), about the transfer of mining powers to the ABG, and the multiple efforts made by the ABG to consult the National Government about development of the Bougainville Mining (Transitional Arrangements) Act 2014, it would be a matter of the gravest concern if you did in fact express the reported views concerning the transfer of mining powers and the Bougainville Mining (Transitional Arrangements) Act 2014. Any attempt by the National Government to control mining in Bougainville could cause most Bougainvilleans to lose all faith in the BPA, and to refuse to work with the National Government any more. Many would want to seek immediate independence. It would be a recipe for severely undermining, perhaps even destroying, support for the BPA. I met with you in Port Moresby on Friday 3rd October (just six days before your meeting of 9th October) and again on Tuesday 18 November. In both meetings our discussion focused on your views about issues concerning Bougainville. Yet you made no mention at all in either meeting of the views you advanced in the meeting on 9th October. It is difficult for me to understand how you could have been unwilling to discuss with me the views you are reported to have stated to the ‘MGU’ team on such important, sensitive and potentially divisive issues. If such views were expressed, they have serious potential for undermining relationships between the ABG and the National Government.In the interests of maintaining a working relationship between your Government and mine, it is essential that you clarify your position on the matters raised in this letter, and that you do so as a matter of urgency.